April 8, 2018: Larry Ruttman joined Dr. Sol Gittleman, Alice and Nathan Gantcher University Professor of Judaic Studies at Tufts University, and others in "Striking Out? 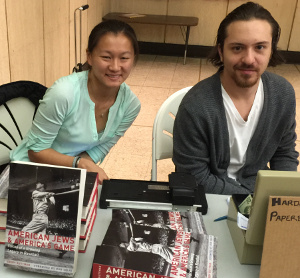 Jews in Baseball," a panel discussion at Temple Obahai Shalom, 1187 Beacon Street, Brookline, Massachusetts. 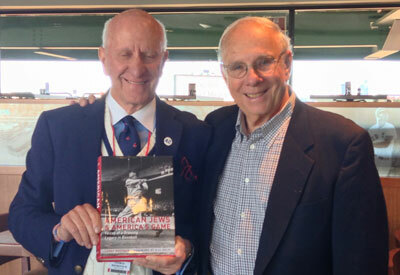 December 6, 2017: Larry Ruttman and Gordon Edes, veteran Boston Globe award-winning baseball journalist and now the official historian of the Boston Red Sox, spoke before an audience of close to a hundred at the opening program of the Biennial Convention of the Union of Reform Judaism (URJ) in Boston, on Jewish players who played for the Sox over the last ninety years. Included in the discussion were recent stars Kevin Youkilis, Craig Breslow, and Gabe Kapler. Spoken about too was Moe Berg, the famed eccentric and brilliant back-up catcher who was a spy for the OSS in WWII. Gordon Edes spellbound the crowd with his touching story about Si Rosenthal, the first Jewish player in Sox history back in the twenties, who was rendered a paraplegic serving in WWII, but whose American and Jewish spirit never faltered in the years ensuing. After the program, the conventioneers were treated to a tour of Fenway Park. April 9, 2017: Larry Ruttman spoke via Facetime to Professor Ira Jaskoll's class of twenty-five students from Yeshiva University enrolled in the Fairleigh Dickinson University Yeshiva and Seminary Program. The program allows yeshiva and seminary students to transfer their various credits to FDU, where they can earn a bachelor’s degree. April 2, 2017 at 10 am: Larry Ruttman spoke about American Jews and America's Game at a baseball-themed breakfast at Temple Beth Israel, 25 Harvard Street, Waltham, Massachusetts. See the event description. March 8, 2017 at 6 pm: Larry Ruttman spoke to the New England Historic Genealogical Society, 99-101 Newbury Street, Boston on "The Fun of Writing Oral History and Biography." November 9, 2015 at 8 pm: The new musical Swing, Schmendrick, Swing!, which is based on American Jews and America’s Game, had a workshop reading at Boston Playwrights’ Theatre, 949 Commonwealth Avenue, Boston. A Q & A followed. Sunday, March 15, 2015: Larry Ruttman spoke at a New England Region of the Federation of Jewish Men's Clubs (NER FJMC) honoring the team captains of the Men's Shul Softball League. At Temple Emeth in Chestnut Hill, Massachusetts. Read the event flyer (PDF). Sunday, October 26, 2014: As the World Series unfolded, Larry Ruttman moderated an All-Star panel at Temple Emanu-El, 1 East 65th Street at Fifth Avenue, New York, New York on the evocative question, “What Will Last Longer, the Jews or Baseball?” His distinguished guests were Alan Dershowitz, longtime American activist, retired Harvard Law School professor, author, and defender; Ira Berkow, Pulitzer Prize winner, author, and former New York Times columnist; Donald Fehr, former Executive Director of The Major League Players Association, and now Executive Director of The National Hockey League Players Association; and Art Shamsky, outfielder for the 1969 World Champion ‘Miracle Mets’ and New York City-based radio and television sports broadcaster. 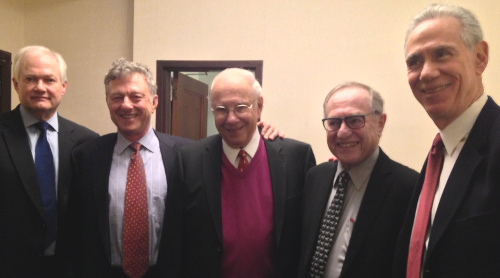 Donald Fehr, Ira Berkow, Larry Ruttman, Alan Dershowitz, and Art Shamsky at Temple Emanu-El. Tuesday, July 8, 2014: Larry Ruttman spoke at “A Night of Americana, Featuring America’s Game and America’s Music” at Park Avenue Synagogue, 50 East 87th Street, New York, New York. The talented male and female cantors of the synagogue provided the music. Wednesday, May 21, 2014: Larry Ruttman gave an author talk and book signing for the American Jewish Historical Society, New England Archives (AJHS-NEA) and the New England Historic Genealogical Society at 99-101 Newbury Street, Boston, Massachusetts. Thursday, May 15, 2014: Larry Ruttman spoke at Temple Sinai of Roslyn under the auspices of the Sid Jacobson Jewish Community Center and Temple Sinai in Roslyn, New York. Read “Jewish Flavor in an American Game,” an article in The Island Now about the event. Monday, May 12, 2014: Larry Ruttman welcomed Barney Frank back home to Brookline at the Brookline Booksmith, 279 Harvard St. Brookline, Massachusetts to discuss Larry’s book, Barney’s place in it, and what is coming next in Barney’s post-Washington life. Sunday, May 4, 2014: Larry Ruttman spoke at Anshe Emeth Memorial Temple, 222 Livingston Avenue, New Brunswick, New Jersey. Sunday, April 6, 2014: Larry Ruttman; Murray Chass, longtime New York Times baseball writer; Bob Tufts, retired Major League pitcher; and Don Fehr, executive secretary of the Major League Baseball Players Association from 1985 to 2009 (and current executive director of the National Hockey League Players Association) discussed the ever-evolving love affair between Jews and the national pastime at the Museum of Jewish Heritage, Edmond J. Safra Plaza, 36 Battery Place, New York, New York. Murray Chass, Larry Ruttman, Don Fehr, and Bob Tufts respond to questions from the audience at the Museum of Jewish Heritage on April 6, 2014. Photo by Melanie Einzig. Tuesday, April 1, 2014: Larry Ruttman spoke at the Massachusetts Historical Society, 1154 Boylston Street, Boston, Massachusetts. Listen to the talk (MP3). Wednesday, March 12, 2014: Larry Ruttman spoke at the Jewish Community Centers of Greater Boston, 333 Nahanton Street, Newton, Massachusetts. Tuesday, December 3, 2013: Larry Ruttman spoke at the Jewish Book Festival at the David Posnack Jewish Community Center in Davie, Florida. Read the story by Marvin Glassman for the Florida Jewish Journal. Sunday, November 17, 2013: Larry Ruttman appeared with fellow baseball authors Robert Weintraub and John Rosengren at the Book Festival of the Marcus Jewish Community Center Atlanta (MJCCA) in Dunwoody, Georgia. I.J. Rosenberg moderated the panel. 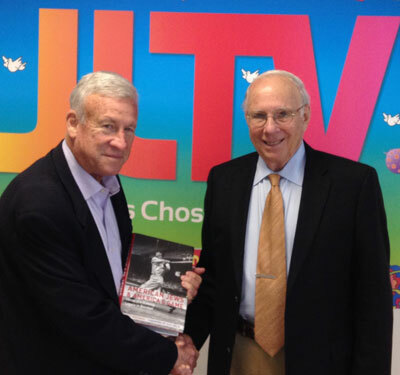 Monday, November 11, 2013: Phil Blazer interviewed Larry Ruttman for JLTV. Phil Blazer and Larry Ruttman, November 11, 2013. 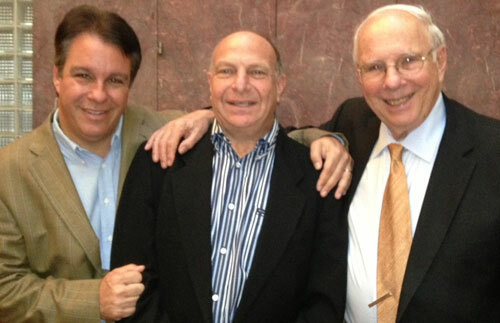 Ben Platt, national correspondent for Major League Baseball Advanced Media and member of Temple Emanuel; Scott Redston, also a member of Temple Emanuel; and Larry Ruttman on November 10, 2013. Photo by Alexander Smith. Wednesday, November 6, 2013: Larry Ruttman spoke at the Valley of the Sun Jewish Community Center in Scottsdale, Arizona. Larry Ruttman during the Scottsdale event. Photo by Joel Zolondek. Thursday, October 31, 2013: Larry Ruttman spoke at the Osher Lifelong Learning Institute at Brandeis University (BOLLI), 60 Turner Street, Waltham, Massachusetts. Monday, October 21, 2013: Larry Ruttman appeared with Andrew Zimbalist, Robert A. Woods Professor of Economics at Smith College, at the Isenberg School of Management, University of Massachusetts, Amherst. 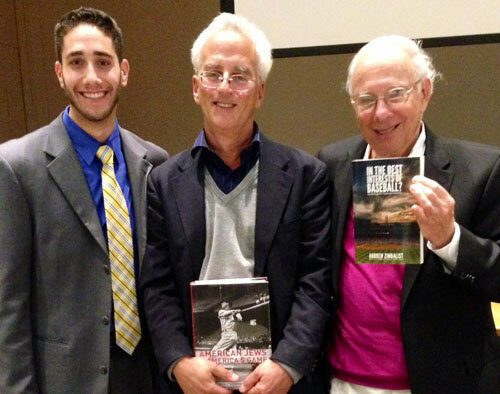 Larry Ruttman with Isenberg School of Management senior Scott Savran and acclaimed baseball economist Andy Zimbalist. Sunday, October 20, 2013: Larry Ruttman spoke at Young Israel of Brookline, 62 Green St Brookline, Massachusetts. Rick Gopen and Larry Ruttman at Young Israel of Brookline. Wednesday, October 16, 2013: Larry Ruttman spoke at his alma mater, Boston College Law School. This event was co-sponsored by the Alumni Association, the Jewish Law Students Association (JLSA) and the Sports & Entertainment Law Society (SELS). Larry Ruttman with Melvin Norris, who graduated from Boston College Law School in 1959, served the renowned Federal District Court Judge, Hon. Charles E. Wyzanski, from 1956 to 1959, and later became the president of the Federal Bar Association. Saturday, September 28, 2013: Larry Ruttman read at the Wellfleet Public Library, 55 West Main Street, Wellfleet, Massachusetts. Thursday, September 26, 2013: Larry Ruttman spoke at Lasell Village at Lasell College, 120 Seminary Avenue, Newton, Massachusetts. Sunday, September 22, 2013: Larry Ruttman spoke at the Brotherhood Brunch at The Community Synagogue, 160 Middle Neck Road, Port Washington, New York. Wednesday, September 18, 2013: Larry Ruttman and Dr. Charles Steinberg, Senior Advisor to President/CEO Larry Lucchino of the Boston Red Sox, spoke as part of the Great Fenway Park Writers Series at the Hotel Commonwealth, 500 Commonwealth Avenue, Boston. Read Kevin Cullen's Boston Globe column about the event. 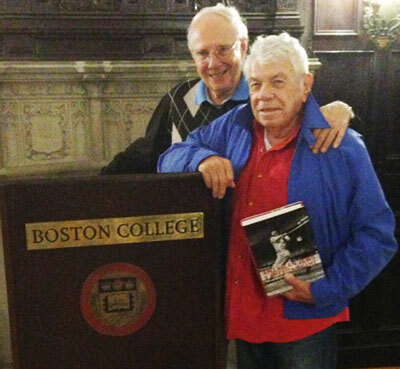 George Mitrovich, chairman of the Great Fenway Park Writers Series, and Larry Ruttman on September 18, 2013. Tuesday, August 6, 2013: Larry Ruttman and renowned Harvard Law School professor and baseball fan Alan Dershowitz announced a home game of the Martha’s Vineyard Sharks. 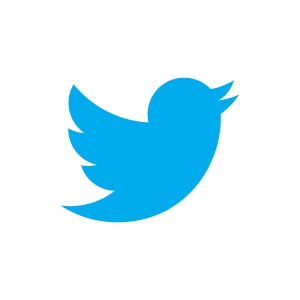 See News for more. Read about and see video of last year's event (commentary begins at 20:36). 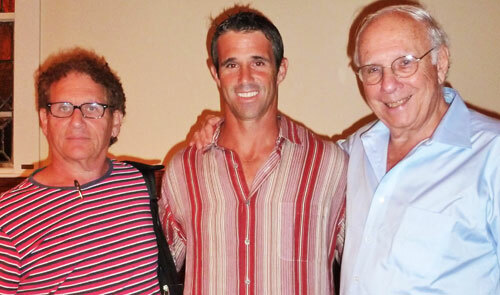 Wednesday, July 24, 2013: Larry Ruttman appeared with Brad Ausmus, eighteen-year All-Star and three-time Gold Glove Major League Baseball catcher, and author Ira Wood at Wellfleet Preservation Hall, Main Street, Wellfleet, Massachusetts. Ira Wood, Brad Ausmus, and Larry Ruttman at the Wellfleet Preservation Hall, July 24, 2013. 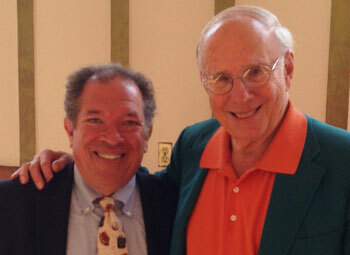 Thursday, July 18, 2013: Larry Ruttman spoke at The Hampton Synagogue, 154 Sunset Avenue, Westhampton Beach, New York. Friday, July 12, 2013: Larry Ruttman spoke at an evening service at Congregation Shirat Ha Yam, Nantucket, Massachusetts. Friday, June 28 - Sunday, June 30, 2013: Larry Ruttman (pictured below, second from left) spoke at the Judaism and Baseball weekend retreat at the Isabella Freedman Jewish Retreat Center, Falls Village, Connecticut. 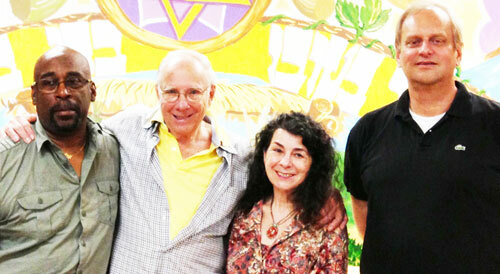 Former Major League Baseball player Elliott Maddox; author and moderator Larry Ruttman; film documentarian Aviva Kempner; and former Major League Baseball player Bob Tufts at the Isabella Freedman Jewish Retreat Center's Judaism and Baseball weekend retreat, June 2013. June 23, 2013: “Baseball: Is It Good for the Jews? An Afternoon of Discussion, Hot Dogs, Soda and Beer.” Larry Ruttman and Dr. Charles Steinberg, Executive Vice-President and Senior Advisor to the President/CEO of the Boston Red Sox, led the discussion at Congregation Kehillath Israel, 384 Harvard Street, Brookline, Massachusetts. Charles Steinberg, Senior Advisor to President/CEO Larry Lucchino of the Boston Red Sox, and Larry Ruttman at “Baseball: Is It Good for the Jews?” Photo by Stuart Rose. June 7, 2013: Larry Ruttman and Sol Gittleman, author, professor, and former provost of Tufts University, spoke at Harvard Book Store, 1256 Massachusetts Avenue, Cambridge, Massachusetts. May 13, 2013: “Holy Land Hardball”: Alan Dershowitz moderated a discussion with film critic Jeffrey Lyons, former Major League pitcher Bob Tufts, and Larry Ruttman: A discussion among baseball-oriented Jews on Israel, America, and baseball in Ruttman’s new book, American Jews and America’s Game. At the 92nd Street Y, 1395 Lexington Avenue, New York, New York. Read Larry Ruttman's blog post about the event. 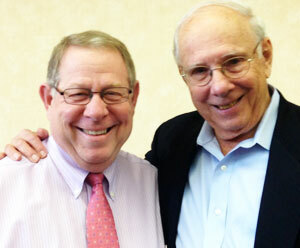 May 7, 2013: Larry Ruttman appeared with Dr. Martin Abramowitz of Jewish Major Leaguers, Inc. at the Newton Free Library, Newton, Massachusetts. April 25, 2013: Larry Ruttman spoke at the Needham Free Public Library, Needham, Massachusetts. 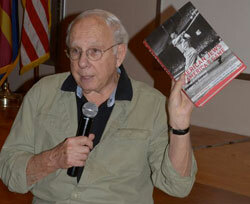 April 18, 2013: Larry Ruttman spoke at the Brookline Public Library, Brookline, Massachusetts. 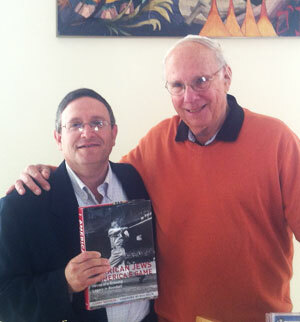 April 17, 2013: Larry Ruttman spoke at the Harvard Coop, Cambridge, Massachusetts. April 9, 2013: Larry Ruttman, Joel Mael, David Samson, and Larry Beinfest appeared before a Florida Marlins/Atlanta Braves game. Read the MLB.com coverage. April 1, 2013 at 10:30 am: Larry Ruttman and Marty Appel appeared at Barnes and Noble, 86th and Lexington (East Side), New York, New York. Order American Jews and America's Game. Book and website copyright © 2013 by Larry Ruttman.